Aspar GP Master is a fun but little-known motorcycle racing game inspired by Jorge "Aspar" Martinez, Spanish world champion who dominated the 125cc class in the 1980s. It is only fitting, then, that his exploits would inspire a game made by Dinamic, one of Spain's best-known game companies. The goal in the game, naturally, is to win the 125cc world championship. You will race against Criville and other famous racers of the period in tracks that span Spain and the globe. 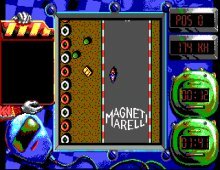 In a break from other motorcycle games, Aspar is played not from a first-person perspective, but from a bird's-eye view that predates Micro Machines by several years. As one can expect from a Dinamic game, the action is fast, fun, although a little too short. Some nice touches include the ability to "save" your championship in progress and come back later, the "track view" mode that allows you to see every track in detail from the same bird's-eye view used in action. Fans of realistic racing games may scoff at Aspar's emphasis on reflexes, but action gamers will likely find it a fun game that's good at what it does.